This weekend ChiIL Mama and the whole family will be ChiILin' in Evanston at The Actors Gymnasium. This stellar little performance venue is a training ground with strong ties to Lookingglass Theatre and alums in theaters and circus arts productions across the city and around the world. Both of my teens have been cast in their youth circus shows and Actors Gymnasium productions have long been favorites of ours. We're particularly excited to see this production since it was written and directed by Leslie Buxbaum Danzig and Amanda Crockett's in it, two more exceedingly talented, long time favorites of ours. Check back soon for our full review. We highly recommend buying tickets in advance ASAP, as Actors Gymnasium shows do sell out. The Actors Gymnasium is proud to announce the world premiere of Quest, an original circus-theater production adapted and directed by Leslie Buxbaum Danzig, featuring original music by Kevin O’Donnell and loosely based on Leo Tolstoy’s short story “The Three Questions.” Quest, part of Actors Gymnasium’s Annual Winter Circus, runs Saturday, Feb. 11 – Sunday, March 19 at Noyes Cultural Arts Center, 927 Noyes St.
Press opening is Sunday, Feb. 12 at 3 p.m. with an opening night party Saturday Feb. 11 at 7:30 p.m. Performance times are Fridays at 7:30 p.m., Saturdays at 4:30 and 7:30 p.m. and Sundays at 3 p.m. Running time is approximately 80 minutes with no intermission. Tickets are $20 for adults and $15 for kids, students and seniors and are available online at ActorsGymnasium.org or 847.328.2795. Once online sales are closed, 1 hour and 30 minutes prior to the show start time, the on-location box office will be open. For group reservations and general questions call 847-328-2795. If online sales are sold out, a limited number of tickets will be available at the door the night of the performance. Quest, loosely based on the Leo Tolstoy story “The Three Questions,” has the protagonist ask three simple, but huge, questions, setting in motion a whirlwind journey to find the answers. The hero with her sidekicks venture through obstacles, misinformation, slapstick fun, unexpected detours, music and songs, near crises and amazing feats of partnership in seek of answers. 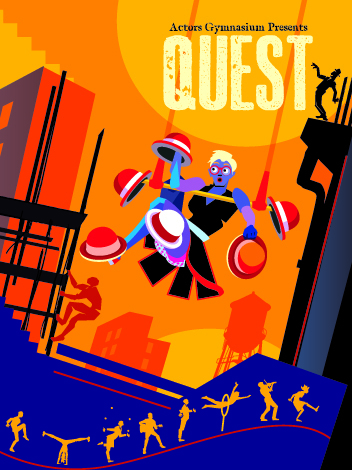 The cast of Quest includes Flora Bare, Kate Braland, David Corlew, Amanda Crockett, Edgar Ortiz and members of Actors Gymnasium’s Teen Ensemble and Young Artists. The production team includes Kevin O’Donnell, original music; Sylvia Hernandez-DiStasi, circus choreographer; Tommy Tomlins, circus co-choreographer and Erin Kilmurray, dance choreographer. Other team members include Jerica Hucke, costume designer; Justine Brock, lighting designer; Isaac Schoepp, rigging designer and Grover Holloway, sound designer. Leslie Buxbaum Danzig is a director primarily of devised theater productions, working with ensembles over the course of a year or more (or less) to create original performances. Her productions often bring together different performance languages (dance-theater, clown-theater, circus-theater). As both theater-maker and audience member she enjoys the unexpected ways in which narrative (of some kind) emerges from shifting performance forms and logics. Buxbaum Danzig has worked extensively with Lucky Plush Productions and is currently co-creating/co-directing Roominghouse, slated to premiere in Fall 2017. She is also a co-founder of the Chicago-based physical theater company 500 Clown. Other directing credits include Damon Kiely's The Revel with the House Theatre of Chicago; Redmoon's The Elephant and the Whale, with Chicago Children's Theater (with Frank Maugeri); Redmoon's Hunchback at New Victory Theater (NYC) and Rockefeller Memorial Chapel at the University of Chicago; and Float with About Face Theater. Prior to turning to directing, she toured nationally and internationally as an actor with NYC's Elevator Repair Service. Buxbaum Danzig is an assistant professor of Practice in the Arts, Theater and Performance Studies, University of Chicago. She received her BA from Brown University and PhD in Performance Studies at Northwestern University, and trained in physical theater at Écoles Jacques Lecoq and Philippe Gaulier. Since 1995, The Actors Gymnasium has been guided by the vision of a revitalized American theatre: one with performances as thrilling as a rock concert and as mesmerizing as the circus. To that end, they have dedicated themselves to the education and development of multi-skilled, physical-theatre artists. Actors Gymnasium classes are taught in a 3,000 sq/ft gymnasium space that features a 1,600 sq/ft sprung floor and a fully rigged 24 foot ceiling. All aerial equipment such as the Aerial Hoop, Spanish Web, aerial silks, static trapeze and more are provided, as well as the equipment for ground skills such as unicycling, juggling, tight wire and gymnastics. Additional classes are taught in Studio 108, a 900 sq/ft classroom space that features a floating sprung White Oak dance floor, a fully rigged 14 foot ceiling, a handstand wall, conditioning ladders and room length 12 foot mirrors for aerial work. The highly skilled instructors create a non-competitive imaginative environment where students can learn as much from each other as their teachers. Students explore their creativity, build courage, and develop community as they tackle circus and aerial arts, physical theatre and so much more.